The Public Square proposal lets New York City reclaim space for pedestrians, as driverless cars and increased car sharing will reduce parking on the streets. With less road space needed for cars, streets could be used for something else. FXFOWLE Architect’s Public Square is a plug-and-play system of interlocking unitized squares, about 8’x8′, with built-in infrastructures, like seating, retail stands, playgrounds, gardens and green space. This project would build on the success the city has had with converting parking spaces into public spaces, like CitiBike’s system. The team imagines this project as not only beneficial to the public but also to the environment. 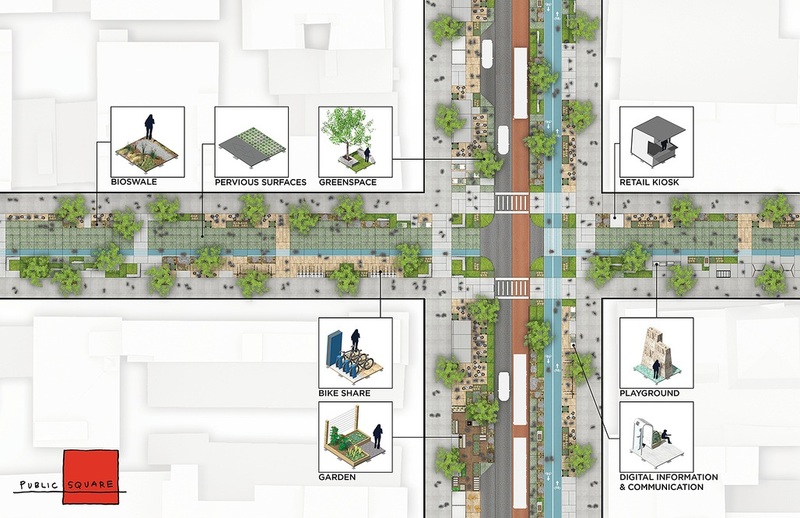 Public Square could provide biofiltration of stormwater, which would reduce the urban heat island effect. The team behind QueueY created an idea to manage the city’s busiest curbs, for high-volume autonomous vehicle pickup and drop-off locations. QueueY establishes a coordinated zone around transit hubs and converts curbside parking into areas dedicated to loading and unloading passengers. 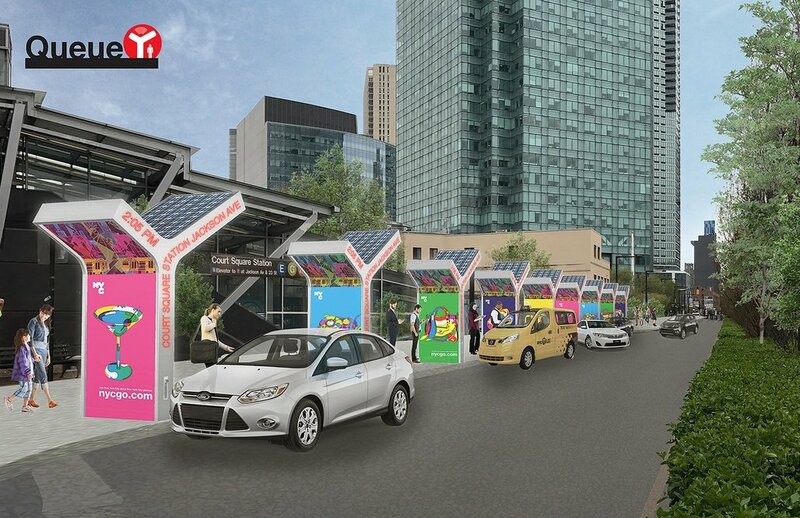 Each waiting area would include a weather-proof overhang in cases of bad weather and include solar-powered LED signs to make it easy to identify, as well as provide space for advertisements. This technology would improve communication between riders and their car as well as increase accessibility to cars for riders without access to the internet. IBI Group’s sAVe project envisions a future where more and more residents move to the outer boroughs and to areas that tend to lack accessible transit service. The team says this relocation will lead to an increase in local and commuter traffic congestion, further isolating vulnerable residents who cannot drive, cannot afford taxis or lack access to subways and buses. To combat this, sAVe would provide trip service in underserved neighborhoods and connect residents to transit hubs they can’t easily access. sAVerides can be booked through a smartphone app, community kiosk or by calling a service representative. The team hopes their proposal would reduce congestion, provide social opportunities and introduce AV technology to communities who may not get to experience it otherwise. The team behind Urban Oasis wants to take advantage of autonomous vehicles by using them to tackle the issue of food deserts in New York City. Urban Oasis would create a new grocery shopping experience that brings goods and services to users with trackable driverless vehicles. The AV trucks would pick up harvested fruits and vegetables from local farms and drive themselves to the city. Employees would be present at farmers markets throughout the city three times per day, providing educational materials and even cooking demos. The service would hire employees from local neighborhoods and could even pick up and drive people who may not have a driver’s license or are unable to drive. Participants assessed the city’s driverless future by looking at Mayor de Blasio’s OneNYC initiative, which plans actions today that hopes to create growth, equity, sustainability and resiliency in the future. In the next few weeks, the four finalist teams will work at the New Lab at the Brooklyn Navy Yard. Then, on July 11, the teams will present their ideas at the “Pitch The City” event at NYU’s Skirball Center. The event is open to the public, and tickets to the Driverless Future Challenge can be purchased here.